The end of the spring semester always brings presentations of final projects, some of which may have been in the works since the fall or even the summer. 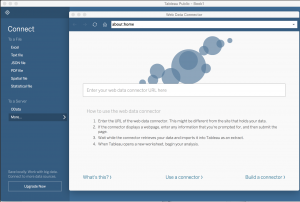 Tableau, a software application designed specially for visualization, is a great option for projects that would benefit from interactive charts and maps. Visualizing survey data, however, can be a bit of a pain. 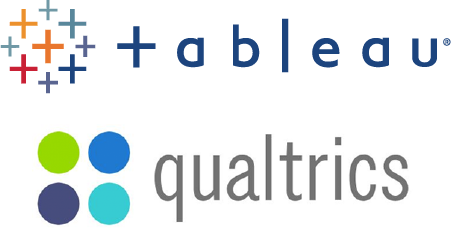 If your project uses Qualtrics, for example, you may be having trouble getting the data ready for visualization and analysis. Qualtrics is an extremely powerful survey tool, but the data it creates can be very complicated, and typical data analysis tools aren’t designed to handle that complexity. Luckily, here at Duke, Tableau users can use Tableau’s Web Data Connector to pull Quatrics data directly into Tableau! It’s so easy, you may never analyze your Qualtrics data another way again. Here are the basics. There are also instructions from Qualtrics. Note: there is an option to “transpose” some of the fields on import. This is useful for many of the types of visualizations you might want to create from survey data. Typically, you want to transpose fields that represent the questions asked in the survey, but you may not want to transpose demographics data or identifiers. 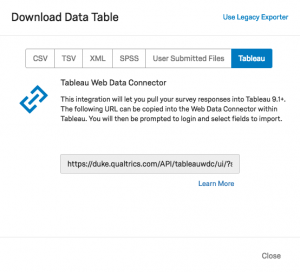 See also the Qualtrics tips on transposing data.